Troll Adventures is a fun adventure game, in which you must visit the famous cities around the world like tower of Pisa in Italy or the Great Wall in China, but avoid being hit by the troll. Now you can enjoy this game online free. Your goal is to click the correct objects or sequences on the area and try to not be trolled, but instead, troll him! Can you pass all the level and see all the amazing adventure? As always, good luck and have a good time. Share this game if you enjoyed this game. You can play Troll Adventures free online shooting games at fogames. It has tags: Adventure,Mouse,Point And Click,Troll. It has 1800 total plays and has been rated 80% (14 like and 9 dislike), find the fun and happy day. 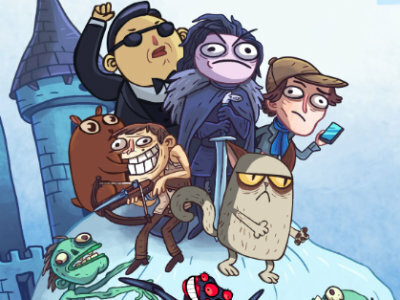 If you want to play more shooting games, we find some of the game: Fancy Pants Adventures Sneak Peek, Big Truck Adventures 3, Troll Face Quest: Video Memes and TV Shows and Screwy Adventures. To play other games, go to the adventure games page, the mouse games page, or just check out the new games or best games page.